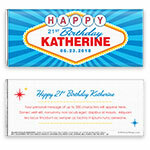 Whether you're celebrating in Vegas or just wish you were, this candy wrapper design is sure to be a hit with your guests! Design: Las Vegas-style sign with bulbs and bold stripes. 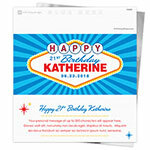 Personalization: Front name, event and date with back title and message.